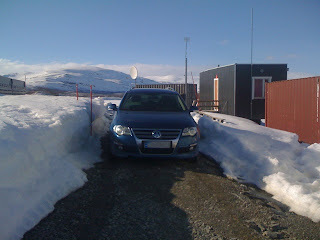 Although spring is well advanced now, there is still plenty of snow on the ground. Because it reflects the light so well, it will actually take a while yet to disappear. However, the areas which have been cleared (like the path in from the site entrance to the container) will heat more readily and melt away the ice. Thus, as shown in this picture, deep snow can exist around the site, but the areas that have been ploughed or driven over clear completely. Deep snow on either side of the cleared driveway into the site. Uniform snow depth over the LBA field.